one of several that will be along Route 131. "Anonymous said...It is interesting no one has complained about that massive stone wall along 131. That could have been made from cement and save plenty of $$$$ to pay for the brick sidewalk. The gigantic stone wall serves no one but drivers who should have their eyes on the road and will never appreciate the stone work." The comment above came galloping out of left field. I let the comment ride, but after a couple of days it began to nag at me. I thought I had misunderstood the purpose of that "gigantic stone wall" on 131. I assumed its purpose was to retain the earth in that area so that it won't spill onto the roadway. It is a functional piece of architecture, and just so happens to have been built from stone. It was not built to solely make the area prettier with stone, it was made to make the area safer, and stone was the material chosen. The wall is also nice to look at for drivers, passengers, and pedestrians. I don't think drivers will loose control of their vehicle as they stare in awe at the beautiful masonry. So, would a wall made from all concrete have saved us some money? I have no idea, but I like the stone wall, and I know I would not have liked a wall made of all concrete, but that's just me. I like the stone, the commenter likes concrete. Different people have different tastes. Somethings cost more than other things, and some things can do a job as well as another, such as concrete and stone. It all comes down to taste, and willingness to pay for ones taste. 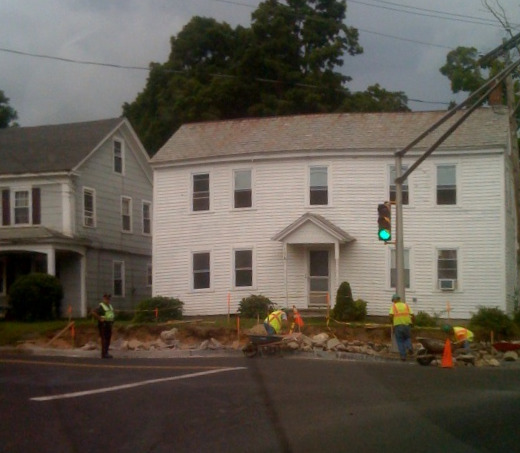 Now, the other day crews were building another stone retaining wall at the intersection of old Route 15 and Route 131. I don't think I would like a concrete wall there, or anywhere else on route 131. Stone is nice. Stone walls are New England, and that small wall looks great. Wally, that was my point. The stone wall is much more attractive but the cost is far more then plain concert. So why weren’t the anti-brick people complaining about the stone wall on 131? Cement is far cheaper but not too attractive and the same can be said for the brick sidewalks. I am in favor of the brick sidewalks and the stone walls. The stonewall in your picture is not the one I was referring to on 131. Also does anyone know what the result of the Selectmen’s meeting was on this issue will it go to town meeting? Agreed, and that stone wall will last a long, long time and won't require maintenance. There is one problem at the Haynes St./Old Route 15 location you have pictured, however, and that is on the other side of that street. Large vehicles coming out of there and making a right turn have historically had difficulty. It's was too narrow, and appears to be much narrower now. Stone wall vs. Concrete wall......great analogy to brick sidewalk vs. concrete side walk. Concrete walls have their place and concrete sidewalks have their place. Stone walls cost more than concrete walls, just as brick walks cost more than concrete walks. Thank goodness the state didn't use concrete walls in their design because one battle is enough when it comes to beautifying the area. Anonymous, I realize the stone wall in the photo is not the one you were referring to. I will make it clearer. I don't know why the anti brick people were not complaining about the stone wall. Maybe because the stone walls were in the original plan. I thought the brick in front of the common was in the original plan, too. We are over budget now. That's one big difference. I was under the impression that the brick sidewalk was in the original plans according to Jim Malloy. If we are over budget there needs to be a request for funding at a town meeting. We can do without the bricks. What do you do at home when you are over your spending limit? Do you just go further into debt, keep on spending anyway, or sit down and have a serious discussion about how much you need whatever it is you would have liked to have had? What I would do at home is think "we're in better shape financially than we thought we were" when I found out that another project in the works came in at half of what I had estimated (Burgess School renovation) and then I would think "since we can afford to make our home more attractive by using product A over product B I think I'll spend the money to make my surroundings the best they can be". I would also think "product A will add value to my home and in the end will be well worth the investment." Brick Sidewalks will add value to our town. If we want to attract tourist and bring them back time after time, then we need to invest in ways that make a visit to Sturbridge a special experience. I could see the handwriting on the wall when the Burgess bid came in lower than expected. One likely reason that the bid came in lower is because people need money and jobs. The same holds true in Sturbridge. These are leans times in lots of homes - and the streets are dotted with foreclosures. We need to discuss this over budget spending on the sidewalk project as a community. The school isn't built yet, and I can just hear all the requests coming up for spending every penny of the money "saved." You may feel like you have an abundance, but we are not all in the same boat. My first thought when I saw that beautiful wall today, was how beautiful the stone walls would look with brick sidewalks. Now think about stone walls + concrete sidewalks. All the improvements to the Center School and Town Hall enhance that town center, which are enhanced by the stone retaining walls, which will be further enhanced by brick sidewalks. With the Publick House willing to chip in and pay for some of the cost, this investment in the community is so worthwhile. We just returned after driving though several beautiful little New England towns today. As has been the custom here in Sturbridge, there were many nice stone walls. We didn't see one brick sidewalk. Guess what?? Concrete sidewalks looked fine with the stone walls. As you many have noticed, today's retaining walls built of stone contain concrete between the stones. If you look at the authentically old stone walls you will find that they do not contain concrete, as there was no cement back then. People used what they had and lived according to their means. Stones in old Fiskdale walls were quarried right in Fiskdale. Good old Yankee ingenuity. Stone costs plenty today, and we are fortunate to be able keep up the beautiful stone wall tradition. We have to draw the line somewhere and saying no to bricks is a good place to start. We didn't have them and we really don't need them. By the way, if you don't know what was located on the town common and in the area of the library during the romantically "historical" years in Sturbridge, you can look it up and you will find a few surprises (knife factory, etc.). We are very fortunate to have the lovely town common we of today, and, I for one, appreciate it the way it is. Brick was to build homes in those days but not for sidewalks, because back then, there wasn't any need for brick walks or concrete sidewalks. So the point made by the last poster is moot. This is now, we live in today. Stone walls, brick sidewalks, restored buildings in the most historic part of this town - sounds good to me. When we choose to do something like brick sidewalks, or a stonewall, we know that we aren't striving for historical accuracy. We just like the way it looks. Concrete is sterile, and without a lot of personality, brick and stone is warmer, and just nicer to look at. Nicer things are usually more expensive, but if we plan ahead, we're OK, if not then we end up with issues. The stone walls are nice, the brick sidewalks would be nice as well as long as they are not cost prohibitive in their installation and maintenance, and safe for those that stumble a lot. In the meantime, the project is making some very nice improvements on that roadway that are long overdue. "Guess what?? Concrete sidewalks looked fine with the stone walls." As a resident of Sturbridge, I want better than "fine." Anonymous also said, "We didn't have them [sidewalks] and we really don't need them." Sidewalks "back then" was absolutely not a need. If it was, yankee ingenuity and manual labor would have kicked in and transformed those muddy lanes to include sidewalks, probably made of brick or flat/cobble stone, because concrete didn't exist. Consider all the time and effort put into building all the beautiful mortar-less stone walls that transverse our New England countryside. Those were built for function, not beauty. So why didn't our forefathers also put time and effort into brick walks if there was a need? However, those old stone walls are beautiful to look at now and they enhance that sense of place, don't they? The new stone walls do the same thing. Today, we do need sidewalks because this town attracts tourists and brick layed in concrete is a better choice. It's above average in quality and beauty - just like this town ought to be. If I lived in a town that didn't have a tourist trade, I would not support brick sidewalks. Also, I would not support brick for that stretch of Route 20 where all the ugly signs and fast food joints are; but I would support brick for parts of Fiskdale - where the businesses that are main attractions are located. Anything that will enhance the sense of place is a good step in the right direction. What's next? Hiring folks in OSV costumes to stroll the streets?